As this year is coming to an end, I have been looking over the statistics that my online hosting service, WordPress, provides regarding readership of this blog. And this year was the biggest year, with the most number of views ever. Now, I don’t ride to the places where I do, or take the photos and write the postings that you see in this blog in order to amass statistics. I do it because I enjoy riding a bike. And learning about the places to which I ride in order to write about them enhances my enjoyment. But I must confess, it’s also been interesting for me to learn about how many people view what I’m posting, as well as the other information which WordPress provides, such as the countries where the readers are located. So that I could put the numbers in perspective in my head, and because I daydream a lot, I imagined myself as a rock star. And I thought about the people who viewed the blog as members of the audience for my imaginary band’s concerts. The statistics indicate that we would sell out the Verizon Center here in D.C. But that would only represent a fraction of the blog views. The band could then sell out other popular venues here in the city, including the concert hall at The Kennedy Center for the Performing Arts, D.A.R. 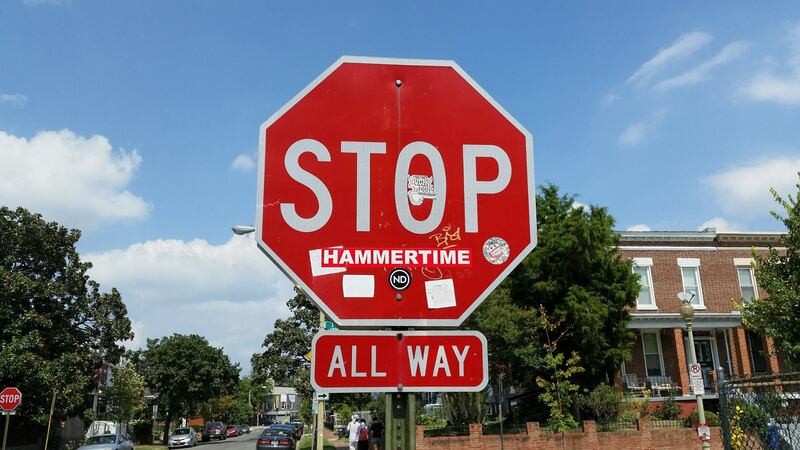 Constitution Hall, The Howard Theater, the U Street Music Hall, The Black Cat club, and the 9:30 Nightclub. But even the combined audiences for all of those performances would not equal the total number of blog views. Which means my band and I could take the show on the road for a U.S. tour. And since this is just my imagination, a warm-up show preceding the actual tour would first take place at the legendary but now closed CBGB’s in New York City’s East Village. From there the band would head across town the next night for the official kick-off of the U.S. tour with a standing room only performance at Carnegie Hall. Then we’d play one more New York City gig, at the Apollo Theater, before we hit the road again. From there, the band would then play to sell-out shows at The House of Blues in New Orleans, The Troubadour in Los Angeles, The Whisky a Go Go in Hollywood, and The Fillmore West in San Francisco. But even with the combined attendance at all of the sold-out shows here in D.C. and throughout the U.S., the band would then have to go on a brief world tour to increase the total attendance to the point where it would equal the number of views for this blog. So in my mind the world tour would begin where the Beatles began, at the Cavern Club in Liverpool. There would then be another show in England, at The 100 Club in London, before moving on to Paris and playing at the reopened Le Bataclan. We would then play Club Ta in Hongdae in Seoul, South Korea, the Ruby Room in Tokyo, and the Ding Dong Lounge in Aukland, New Zealand. Then we would wrap up the final leg of our world tour with a sold out show in the concert hall at the Sydney Opera House in Australia. By the end of the tour we would have played in only a half dozen countries altogether. But based on the location of the readers of this blog, as identified by WordPress, the audience would have been comprised of people from 125 different countries throughout the world. And I must say, it’s difficult to believe but at the same time amazing to me that people in 125 different countries have read my blog. There are currently 195 countries in the world. So my goal for the coming year is to gain at least one reader in each of the remaining countries. Maybe then my imaginary band and I will go back on tour. And until then, I’ll just keep riding my bike and exploring our nation’s capital one ride at a time. 27 – Seagulls near a puddle in the parking lot at Robert F. Kennedy Stadium. Below I have included more photos that I took at different times over the past year, but were not previously included in this blog. They had not been previously posted because what they depict are not necessarily main ingredients in what I like to call the recipe of this city. I consider them to be more like ingredients that contribute to the overall flavor. I hope you enjoy them. And I hope you will continue to follow this blog, and enjoy the posts as much as I enjoy everything that goes into them. 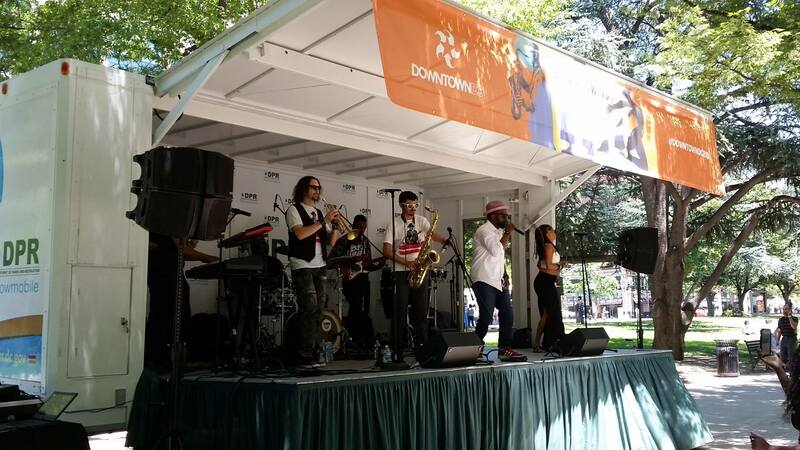 28 – One of the mid-day summer performances in Franklin Square Park. 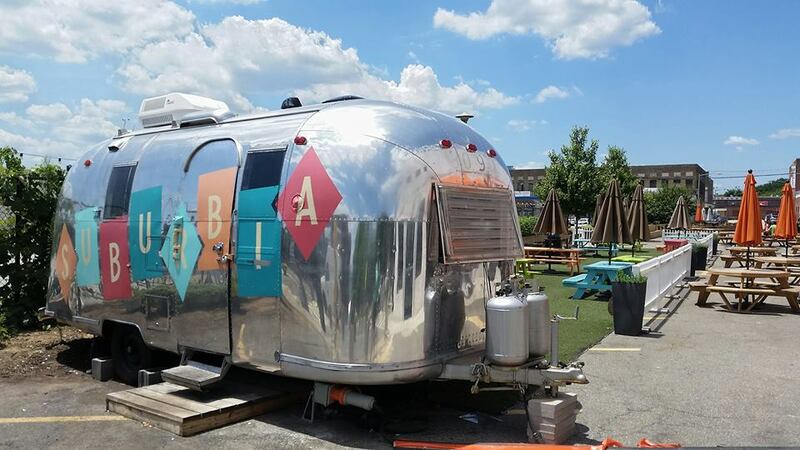 29 – The Suburbia airstream bar in the parking lot in front of Union Market. 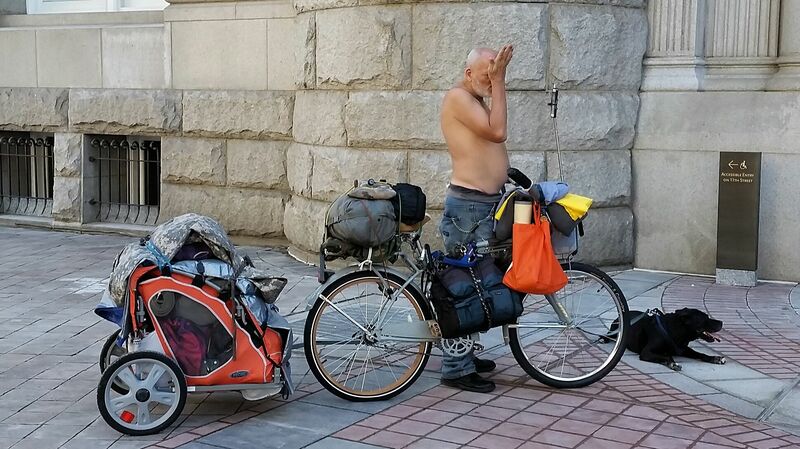 31 – A weary-looking bike tourer and his dog in front of the Trump International Hotel. 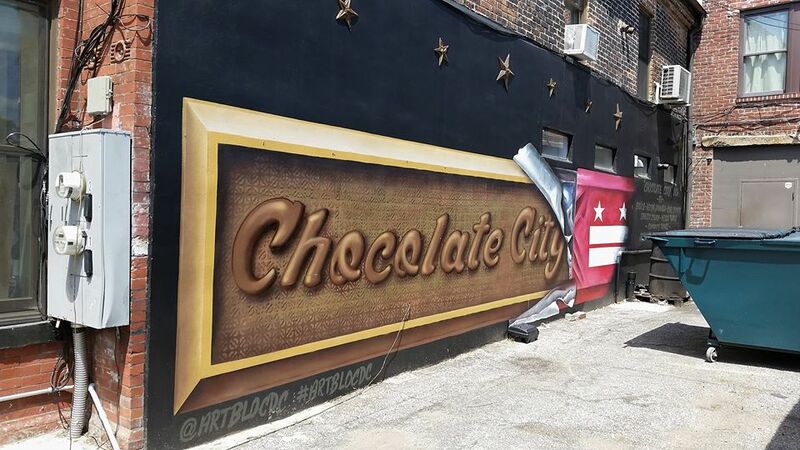 32 – The Chocolate City mural in an alley near 14th and S Streets in the U Street Corridor. 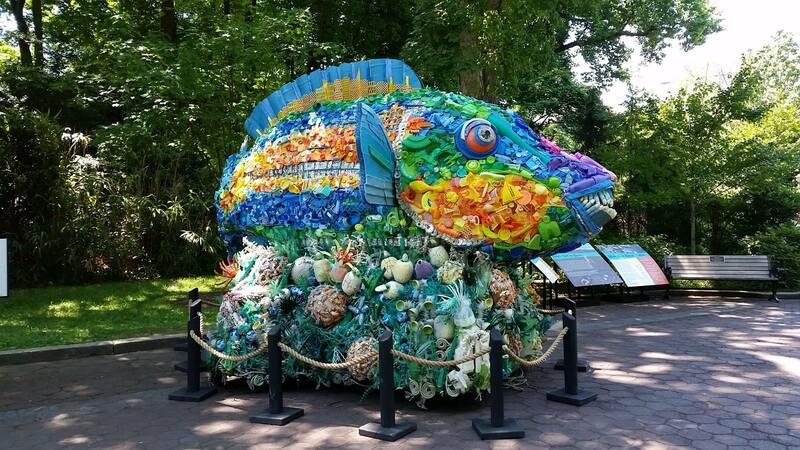 33 – One of the colorful artworks at the National Zoo made entirely of trash taken from the ocean. 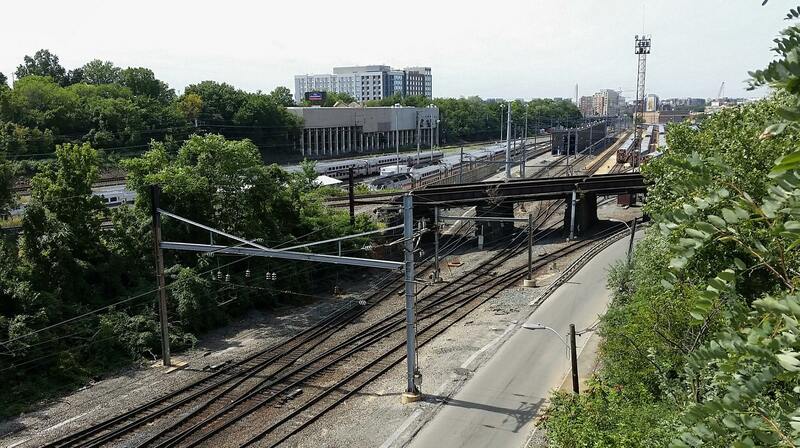 34 – An overview of the WMATA rail yard in Brentwood. 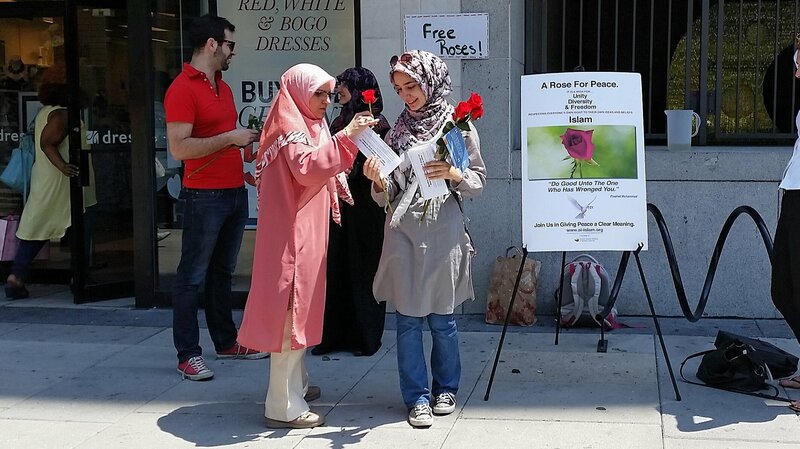 35 – A peaceful promotion of Islam and the Al-Islam online digital library by a young woman handing out roses. 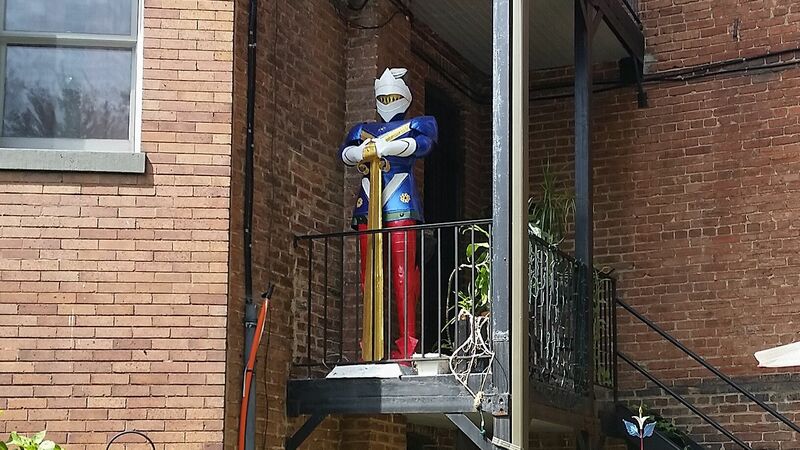 36 – A colorful knight, or at least suit of armor, guarding the balcony of an apartment on Capitol Hill. 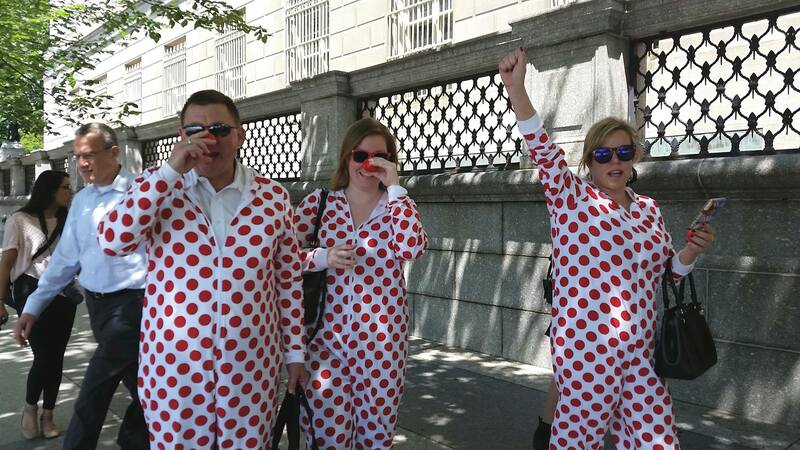 37 – Some promoters of Red Nose Day raising awareness and money to help raise kids out of poverty. 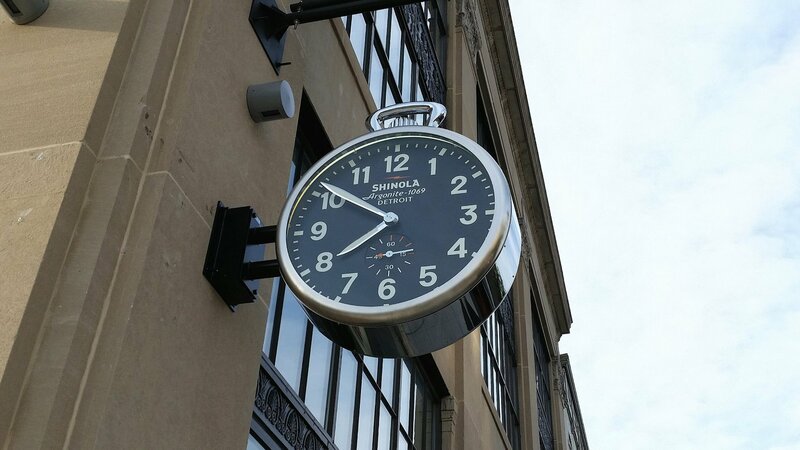 38 – A clock on the side of a building on 14th Street in the U Street Corridor. 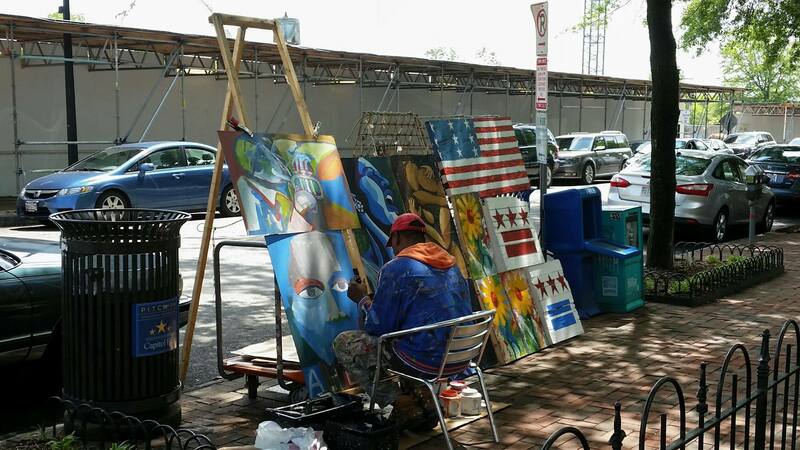 39 – An artist working and displaying his wares on the sidewalk near Eastern Market. 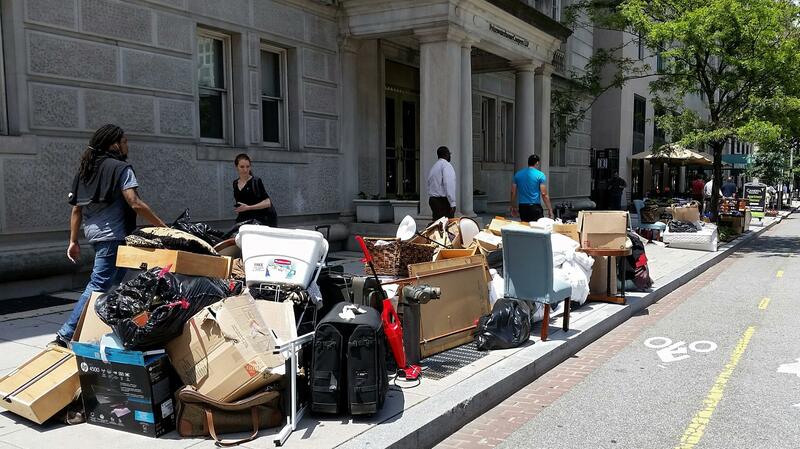 40 – Evidence of an eviction in front of an apartment building in Downtown D.C.
41 – The iconic dome of the U.S. Capitol Building towering over trees on the Capitol grounds. 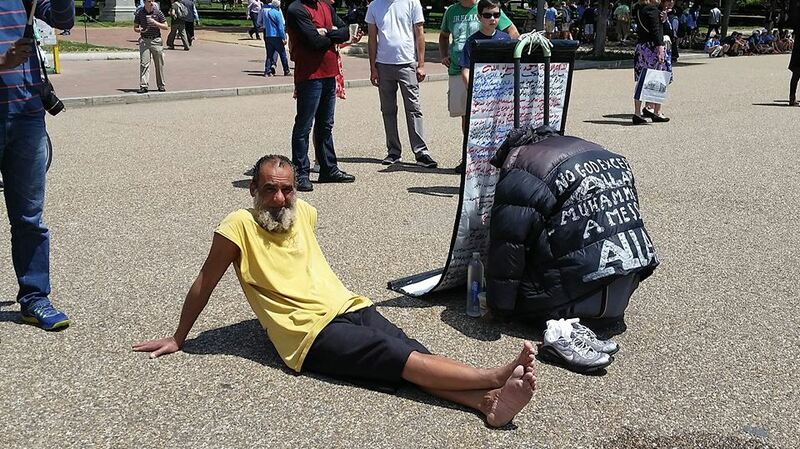 42 – A Muslim protestor in front of The White House taking a break. 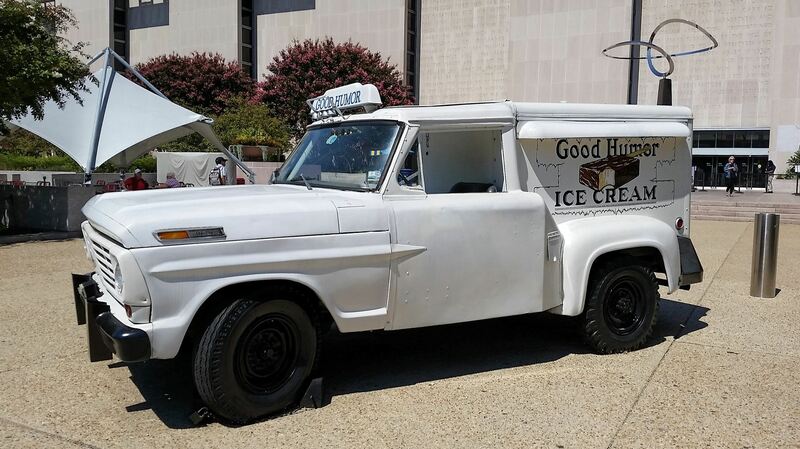 43 – One of the many Little Free Libraries I have seen throughout D.C.
44 – An antique Good Humor ice cream truck in front of the Smithsonian Museum of American History. 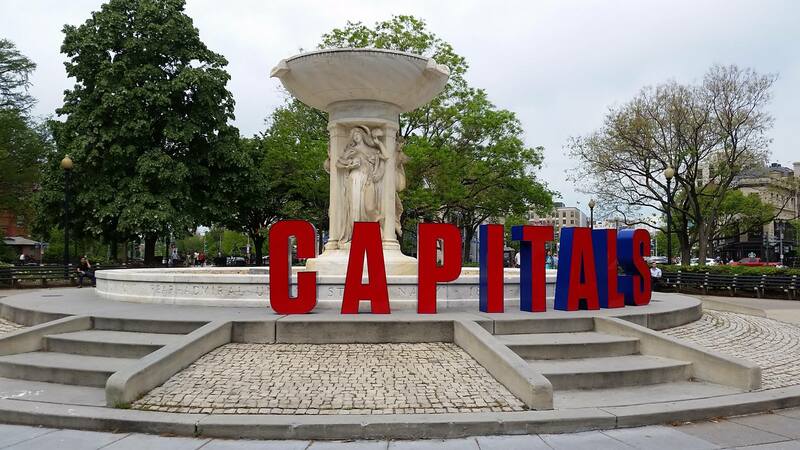 45 – A promotion for the Washington Capitals using the DuPont Circle Fountain. 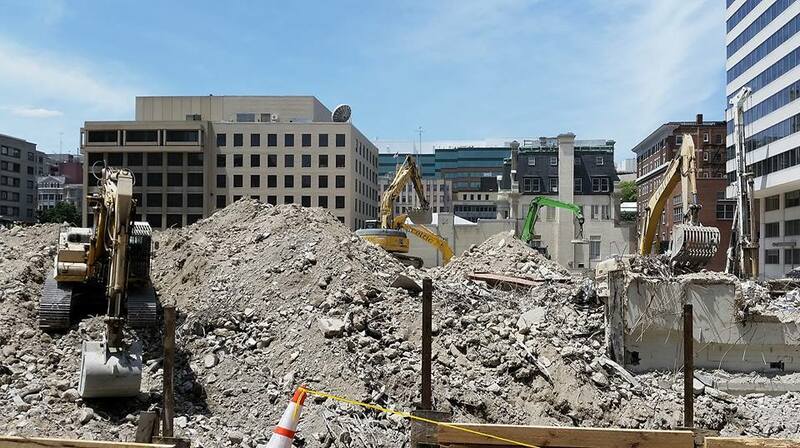 46 – Demolition of an office building at the corner of 13th Street and Pennsylvania Avenue. 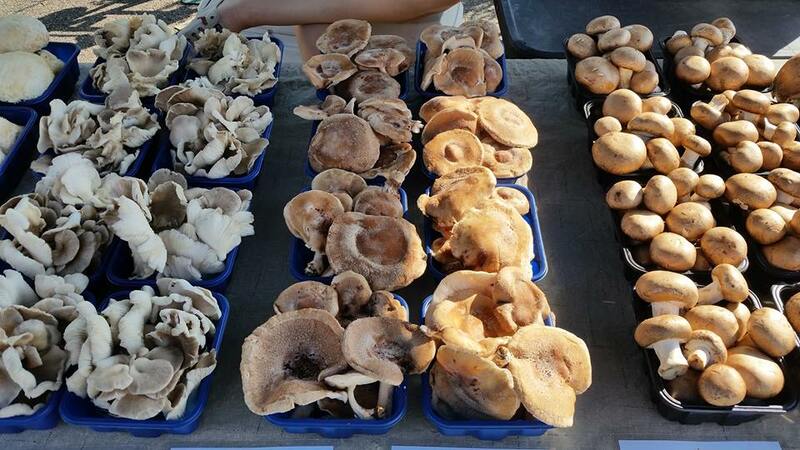 47 – Mushrooms at the Department of Agriculture Outdoor Farmers Market. 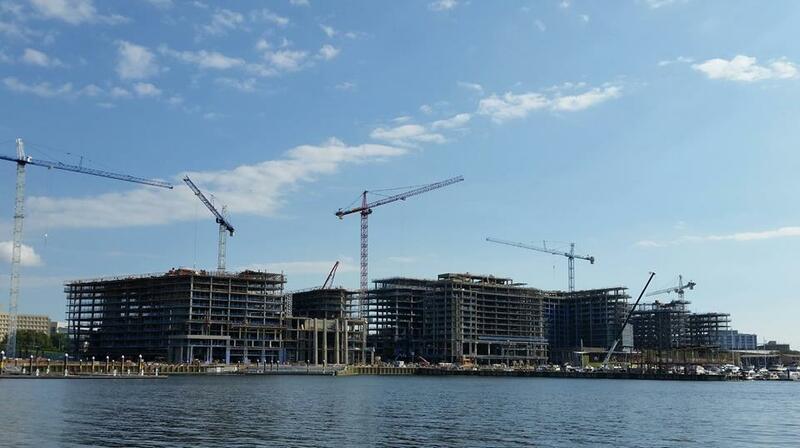 48 – Construction on the southwest waterfront development project. 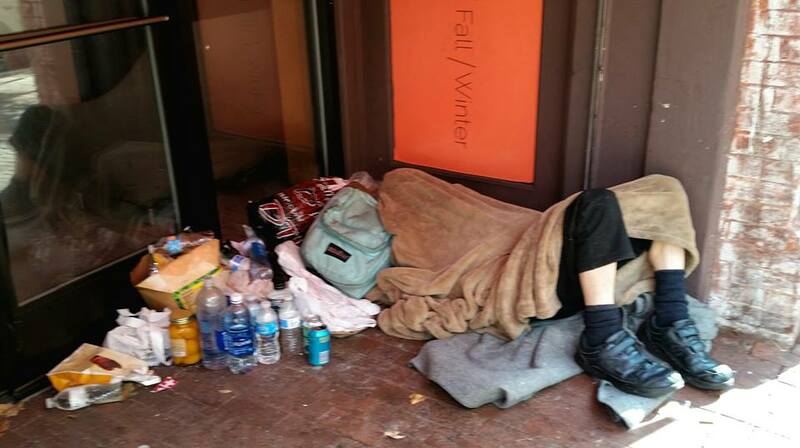 49 – A homeless man in a doorway on 8th Street, ironically next door to The Lansburgh, a luxury apartment building. 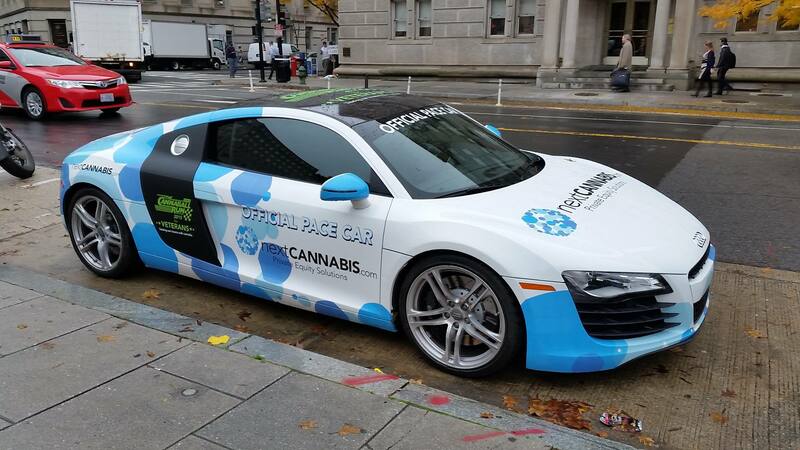 50 – A company car for a marijuana advocacy and investment group. 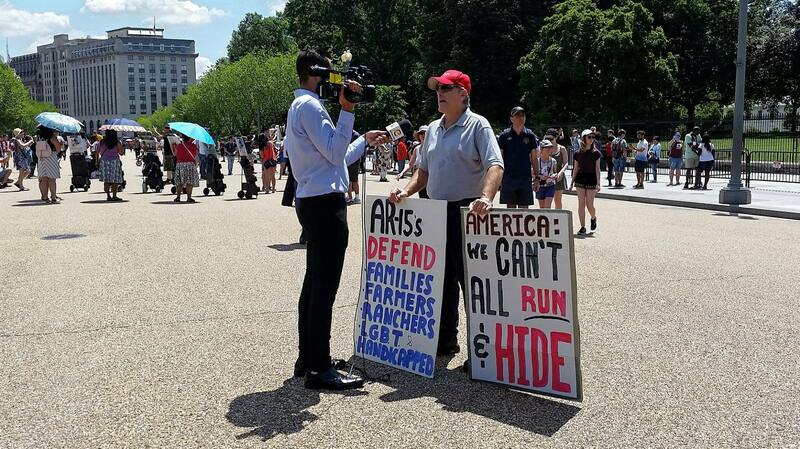 51 – A lone gun rights advocate demonstrating in front of the White House. 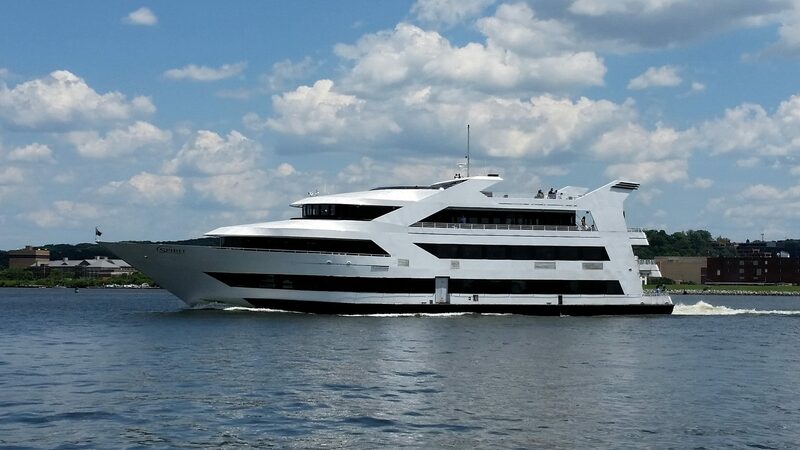 52 – The Spirit of Washington dining ship in the Washington Channel. NOTE: Check out Part 1 of my year-end collection of various photos on yesterday’s post. Back in May of this year I wrote a post about meeting my original goal for this blog, and what my future goals would be. Along with that post I also published a couple of dozen miscellaneous photos that I had taken during my lunchtime bike rides, but had not previously used for other posts on this blog. As this year is rapidly coming to an end, I decided to post some more miscellaneous photos. So below I have included a couple of dozen more photos that I took at different times over the past year, but have not used for this blog. Be sure to click on each of the photos to view the full-size versions. 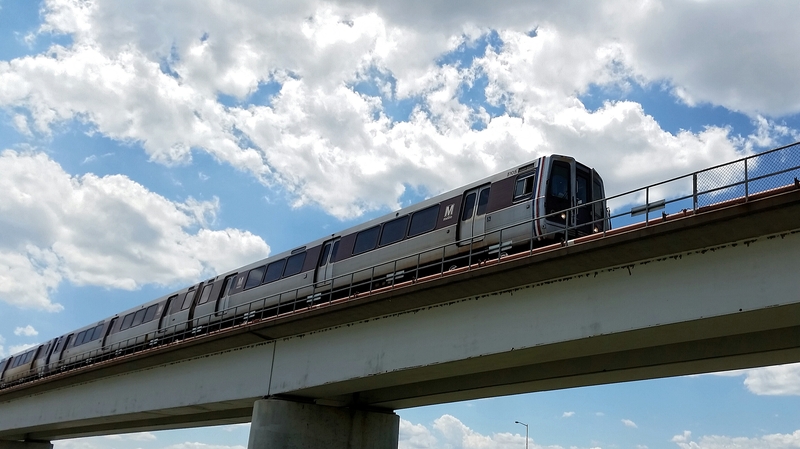 1 – A Metro train inbound from Alexandria to D.C. as it passes over the Potomac River. 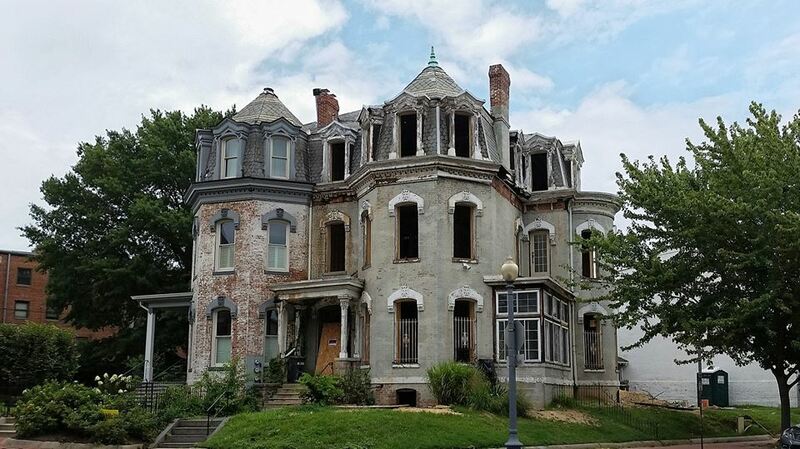 2 – A hauntingly beautiful abandoned mansion located on Cooper Circle in LeDroit Park. 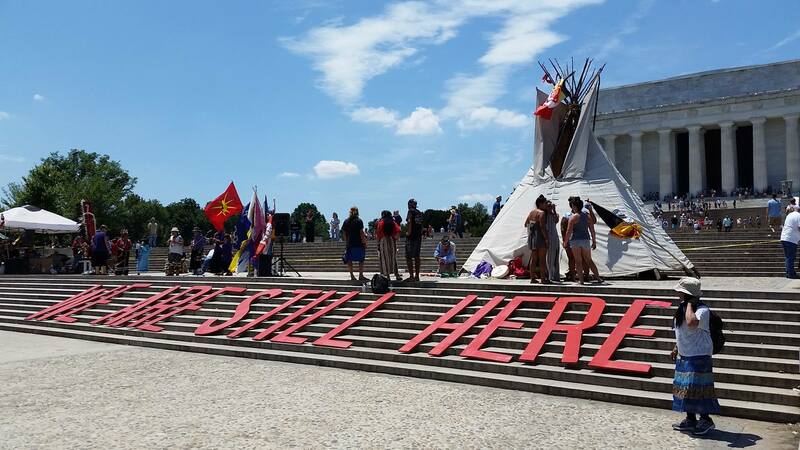 3 – A demonstration by Native Americans on the steps of The Lincoln Memorial. 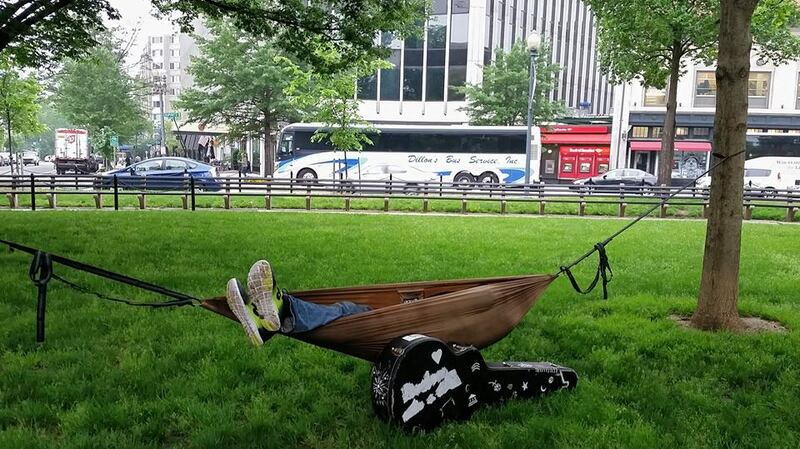 4 – A musician taking a mid-afternoon nap in the park at DuPont Circle. 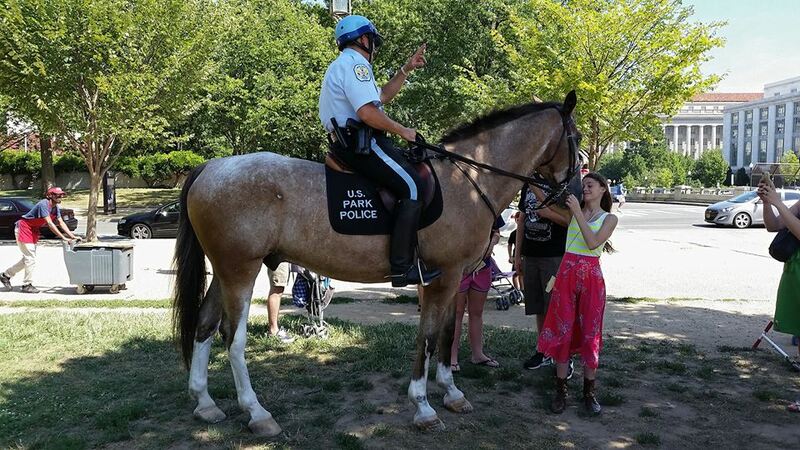 5 – A young girl admiring a mounted Park Police officer’s horse on the National Mall. 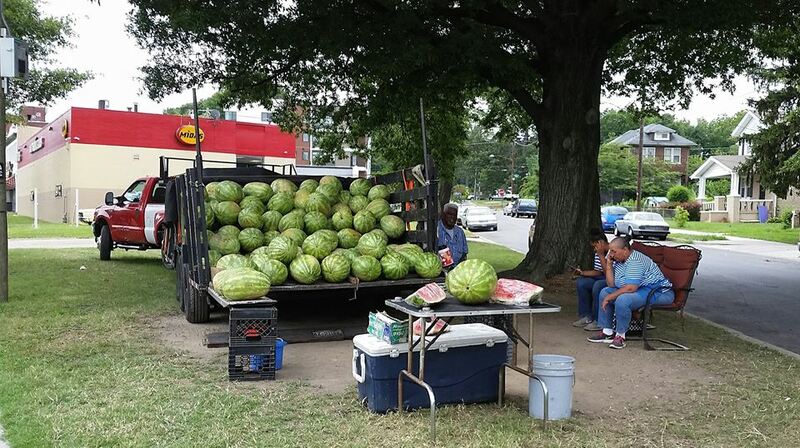 6 – An old farmer and his family selling watermelons out of the back of a truck on Rhode Island Avenue. 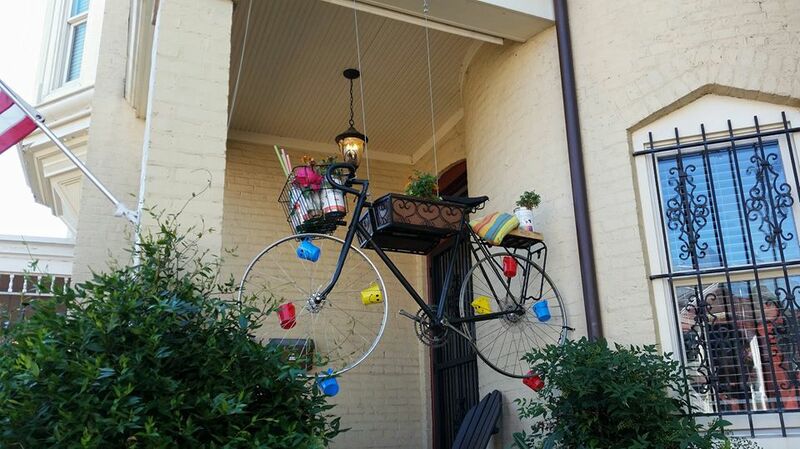 7 – A bike repurposed as a planter on the front porch of a home in LeDroit Park. 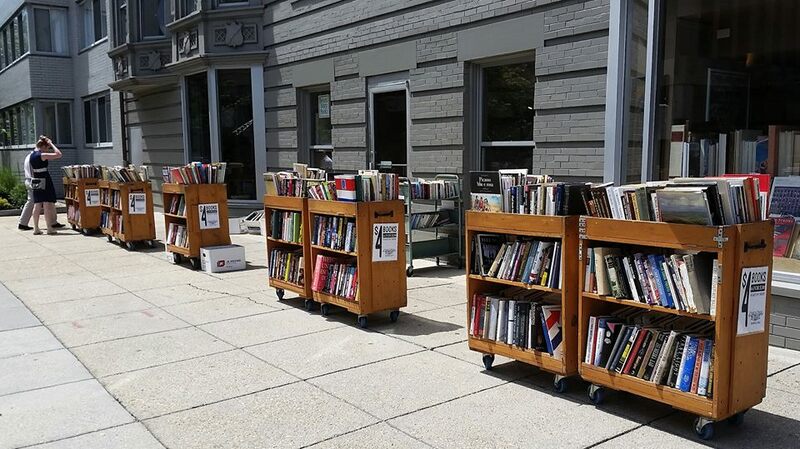 8 – A book sale at Second Story Books at the corner of 20th and P Streets in DuPont Circle. 9 – A mural interplaying with the shade of the leaves of a nearby tree on Capitol Hill. 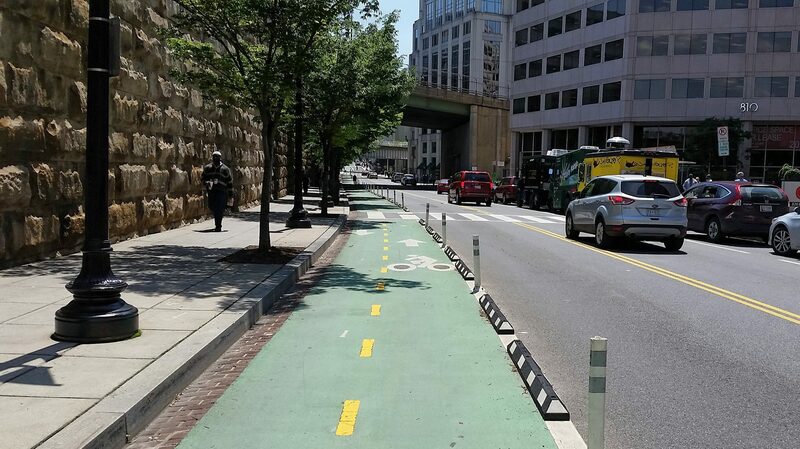 10 – The First Street protected bikeway connecting Union Station to the Metropolitan Branch Trail. 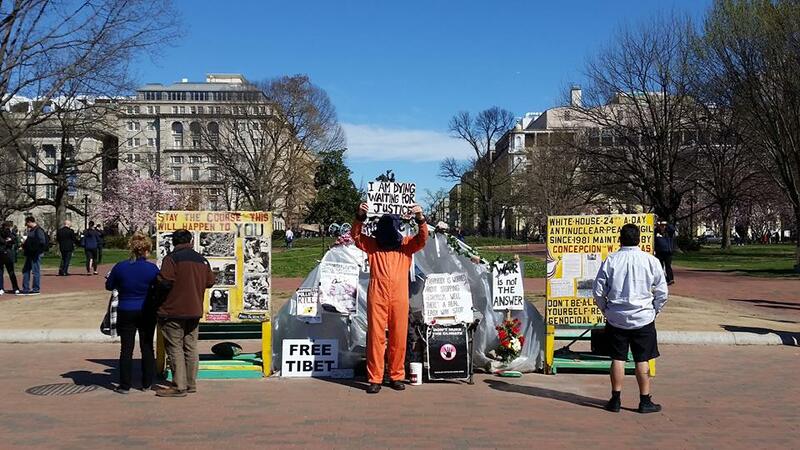 11 – A merging of protests in front of The White House and Lafayette Square Park. 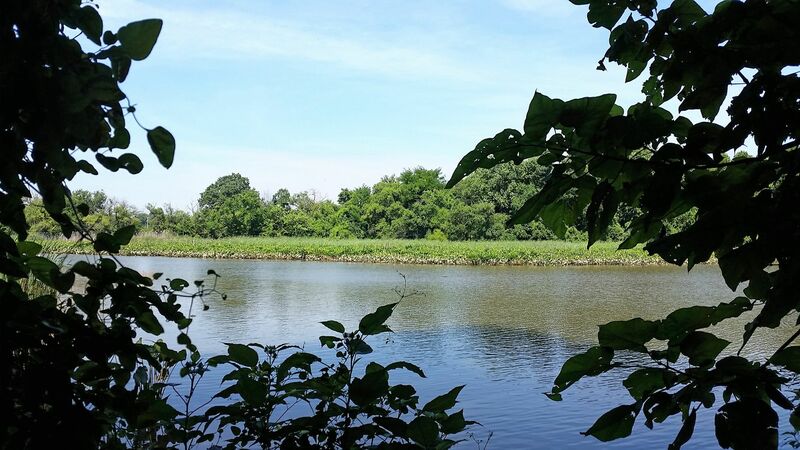 12 – A view of the Anacostia River through the thick growth of vegetation on Kingman Island. 14 – Demolished buildings on 14th Street making way for new Downtown construction. 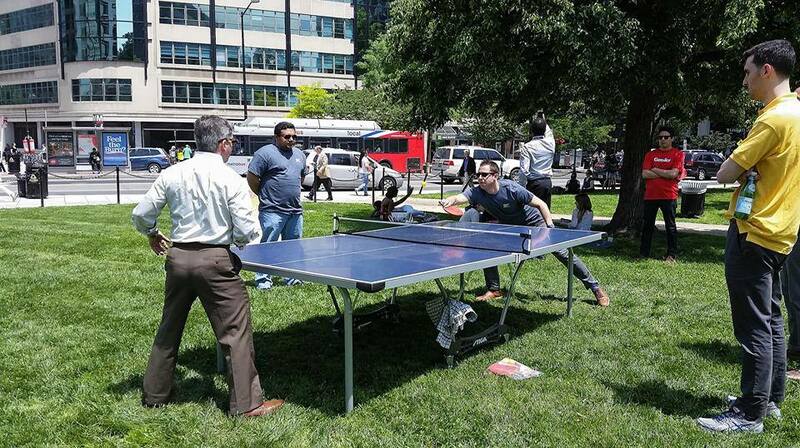 15 – A ping pong game in the Farragut Square Park sponsored by the Golden Triangle Business Improvement District. 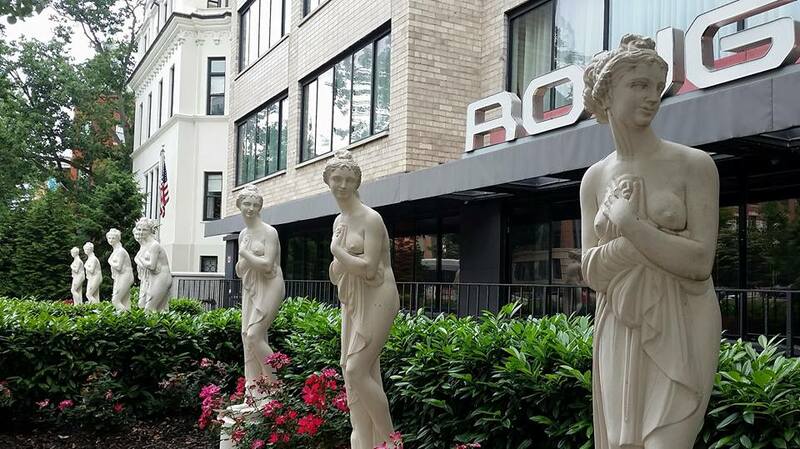 16 – Statues outside Bar Rogue in the Kimpton Rouge Hotel on 16th Street. 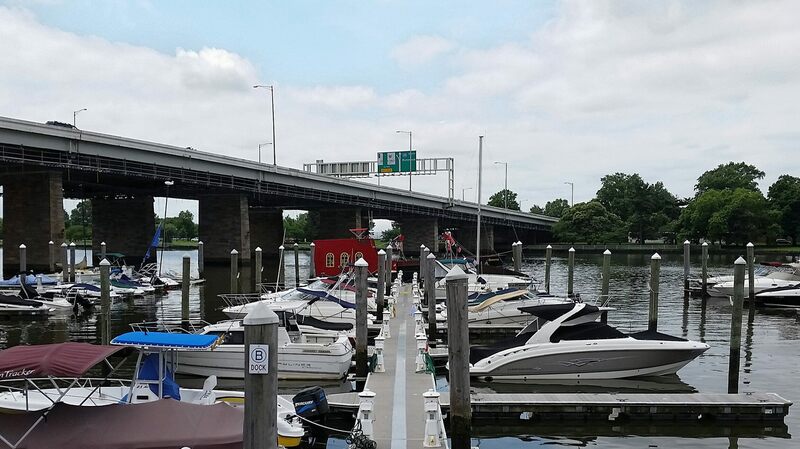 17 – The former Addiction Prevention and Recovery Administration headquarters building on First Street in northeast D.C.
18 – Boats docked on the Southeast Waterfront just west of the Maine Avenue Fish Market. 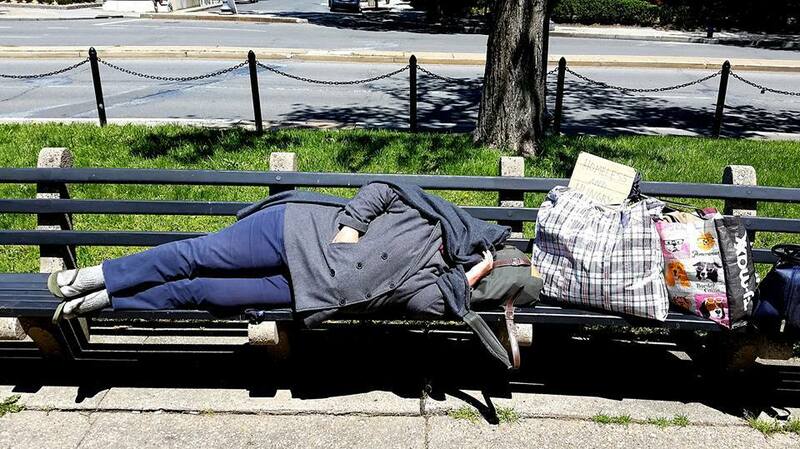 19 – A homeless woman who spends her days on a bench in DuPont Circle Park. 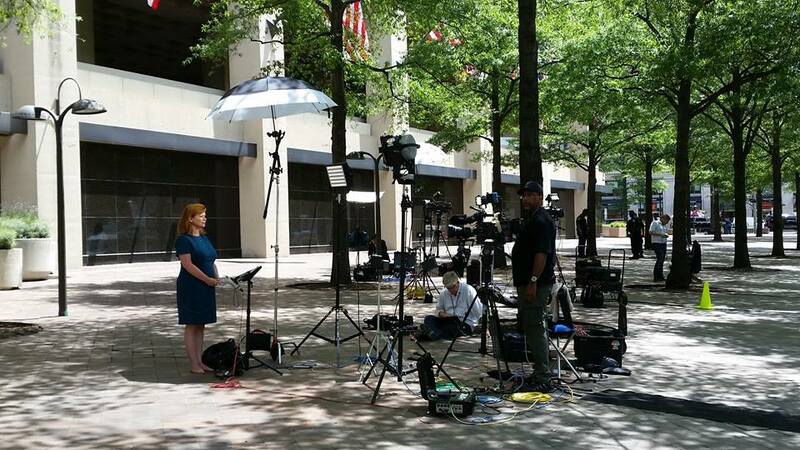 20 – A news reporter broadcasting live from in front of FBI Headquarters. 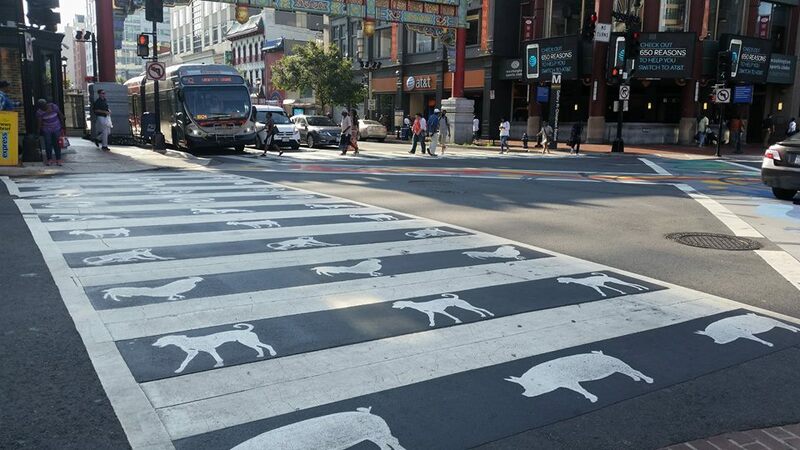 21 – Chinese zodiac signs adorn the crosswalk at 7th and H Streets near The Friendship Archway in Chinatown. 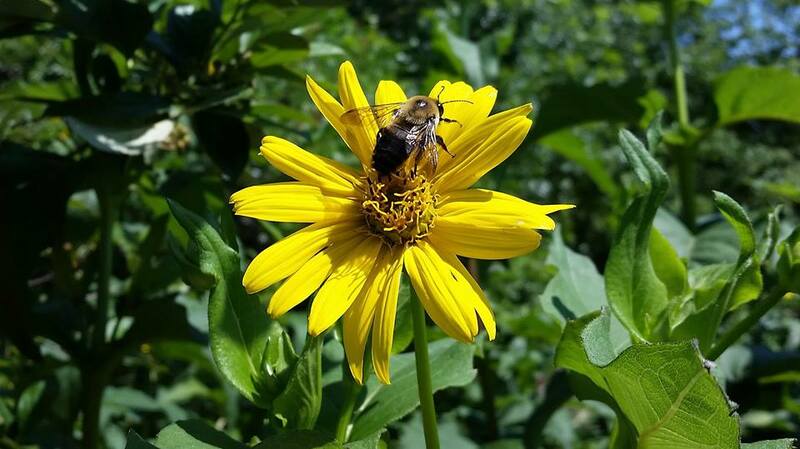 22 – A bee pollinating a flower in The Smithsonian’s Butterfly Habitat Garden. 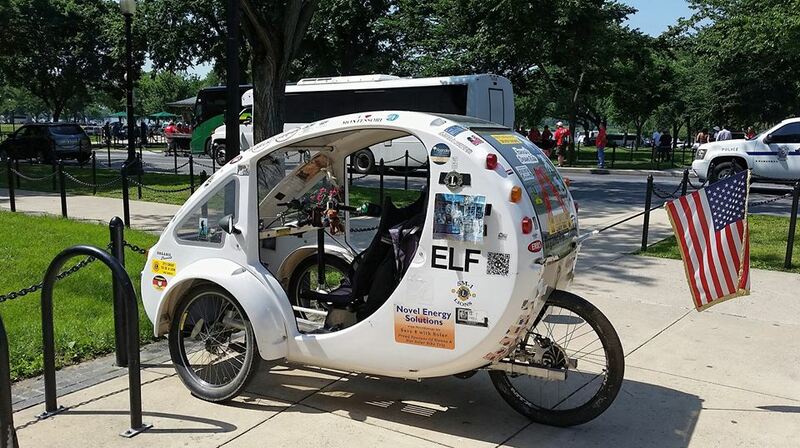 23 – An Organic Transit ELF vehicle parked at a bike rack on the National Mall. 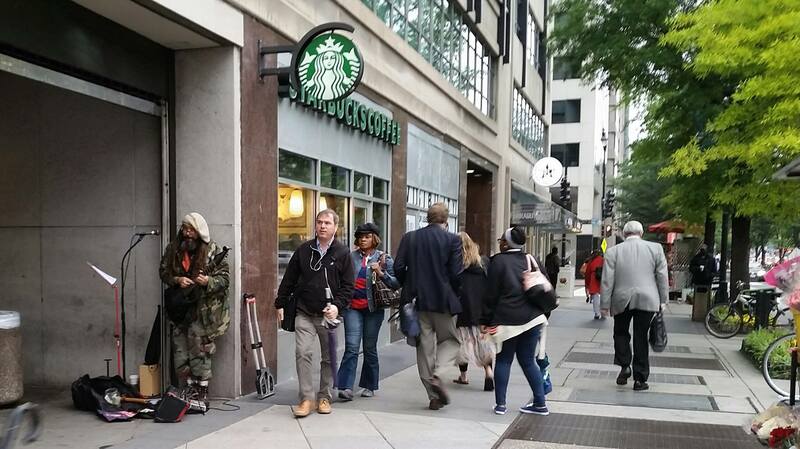 24 – A street musician playing for tips outside the Farragut North Metro Station during the morning rush hour. 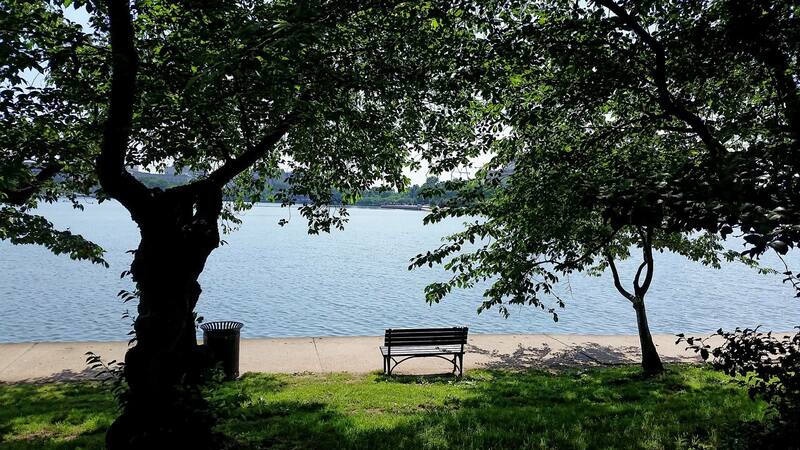 25 – A bench with a view on the southern side of the Tidal Basin. NOTE: Come back tomorrow for Part 2 of my year-end collection of various photos. The United States Capitol Building is a world-renowned architectural icon and one of the most recognizable buildings in the world. 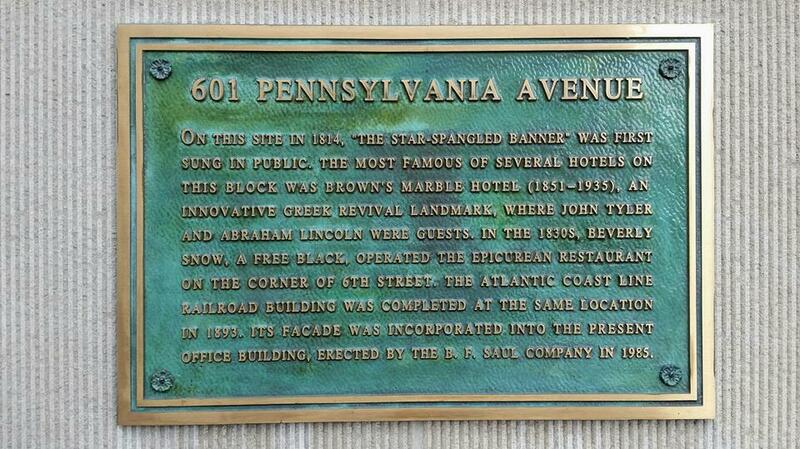 It is located at 100 Constitution Avenue (MAP) atop Capitol Hill at the eastern end of the National Mall. Though not at the geographic center of the Federal District, the Capitol forms the origin point for the District’s street-numbering system and the District’s four quadrants. I’ve ridden both to it and past it hundreds, if not thousands of times, and on this lunchtime bike ride Julius and I rode there again. 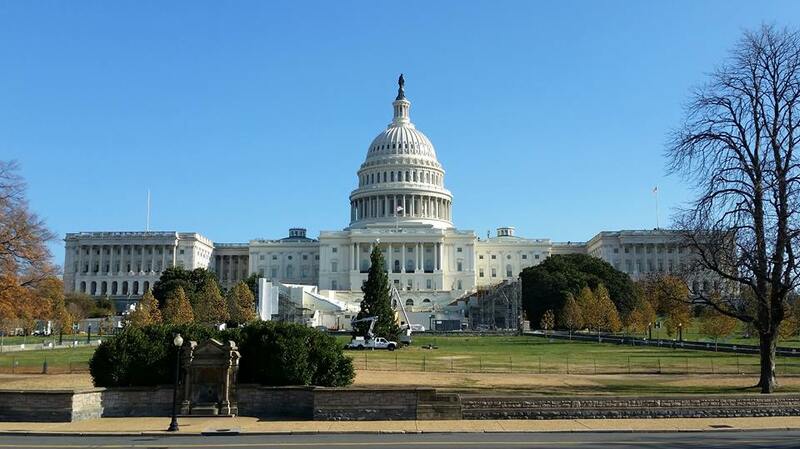 And although I usually write in this blog about the lesser-known monuments and attractions in D.C., for this last lunchtime bike ride of the year before I take a little time off from work for the holidays, I time I decided to break from tradition and write about the Capitol. It was Pierre Charles L’Enfant who chose the location within the new capital city for the building in which Congress could meet. Tasked with creating the city plan, he chose what was then known as “Jenkin’s Hill” as the site for the “Congress House”, with a “grand avenue” that would later be named Pennsylvania Avenue connecting it with the “President’s House”, and a public space stretching westward to the Potomac River. 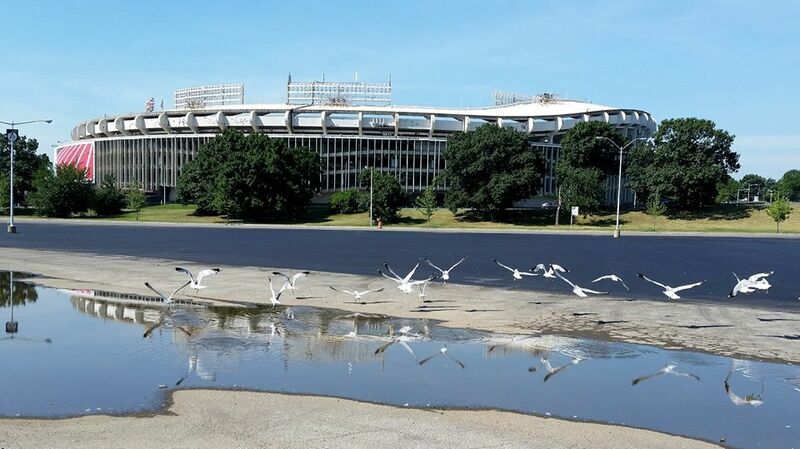 That public space is now known as the National Mall. However, in reviewing L’Enfant’s plan, Thomas Jefferson insisted the legislative building be called the “Capitol” rather than “Congress House”. In the spring of 1792, Jefferson proposed a design competition to solicit designs for the Capitol and the President’s House. A four-month deadline was set, with a prize of five hundred dollars and a lot of land in the new capital city to go to the winner. Of the 17 submitted designs, all of them were turned down. A Scottish doctor named and amateur architect named William Thornton submitted the design which was eventually chosen, although it came in after the deadline for the contest. The following year Thornton was appointed to serve as the first Architect of the Capitol, a position that still exists today. Thornton’s original design was later modified by the famous British-American architects Benjamin Henry Latrobe, Sr., and then Charles Bulfinch. 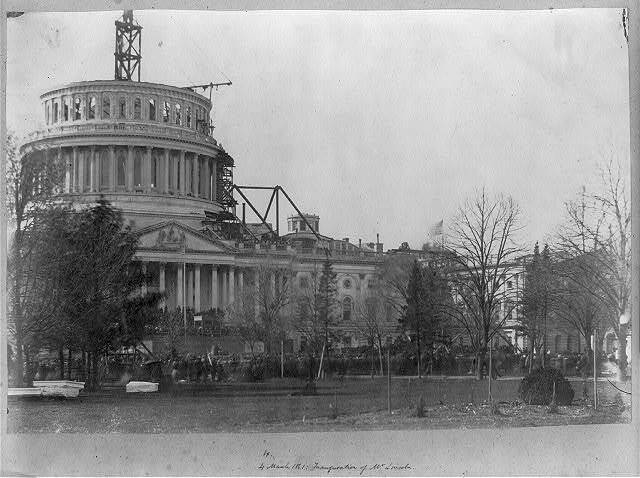 On September 18, 1793, first President George Washington, along with eight other Freemasons dressed in masonic regalia, laid the cornerstone for the new Capitol Building. The original building was completed in 1800, and Congress met for the first time in the newly-created Capitol in November of that year, approximately 11 months after the death of George Washington. Eventually, the current cast-iron dome was added. 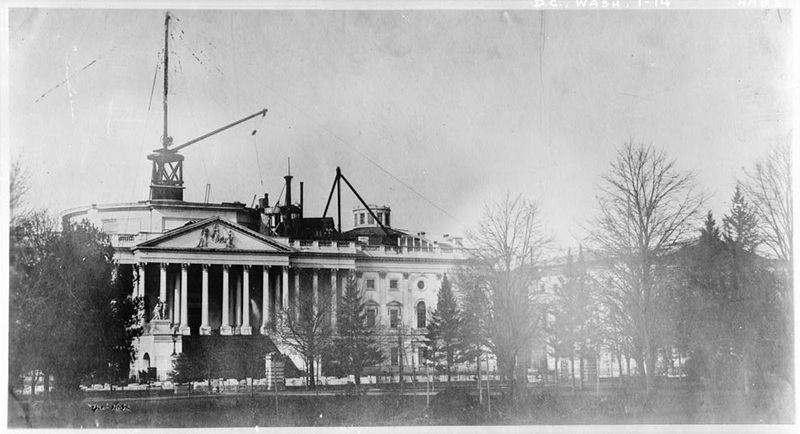 A new southern extension for the House of Representatives and the Senate’s new northern wing, designed by Thomas U. Walter and August Schoenborn, were added in the 1850’s, giving us the building we see today. Like the principal buildings of the executive and judicial branches, the Capitol is built in a distinctive neoclassical style and has a white exterior. Both its east and west elevations are formally referred to as fronts. However, the east side of the Capitol is the only one with level ground for a proper entrance, so it was intended for the reception of visitors and dignitaries. This gives the appearance that the building faces away from the Mall instead of toward it, like most other important buildings and monuments. But the Capitol and the statue on top face toward the east so that it faces toward the people who are entering it. Books could be written about the complete history of the Capitol, its appearance, and other aspects of the building. But rather than go into that kind of additional detail, I decided to simply provide some of the information I find most interesting about the building that is the seat of the legislative branch of the Federal government and serves as a symbol of American democracy. The Capitol covers well over 1.5 million square feet on five separate levels, has 540 rooms, contains approximately 850 doorways, and has 658 windows, with 108 of those windows in the dome alone. The Dome is 8,909,200 pounds of cast-iron and was constructed between 1855 and 1866. The The building covers a ground area of 175,170 square feet, or about 4 acres, and has a floor area of approximately 16-1/2 acres. Its length, from north to south, is 751 feet 4 inches; its greatest width, including approaches, is 350 feet. 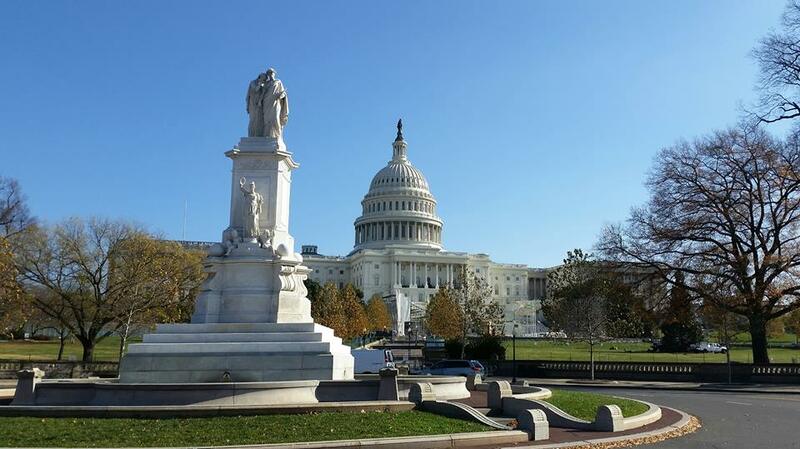 Its height above the base line on the east front to the top of the Statue of Freedom is 288 feet. 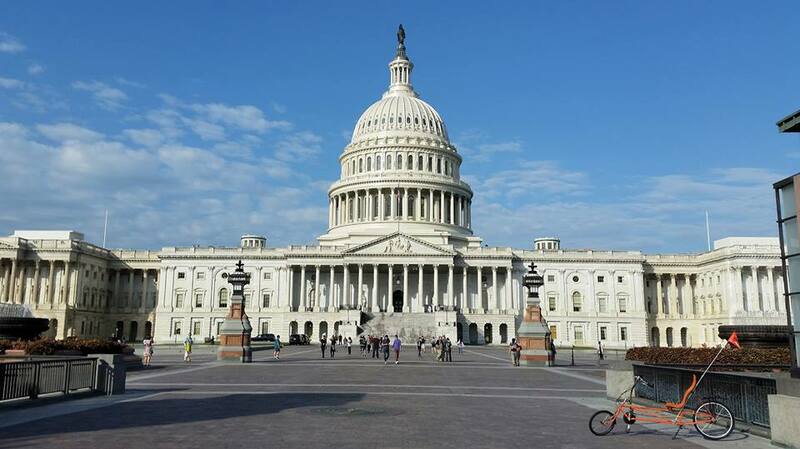 There used to be a law that no building in the capital city could be taller than the Capitol. 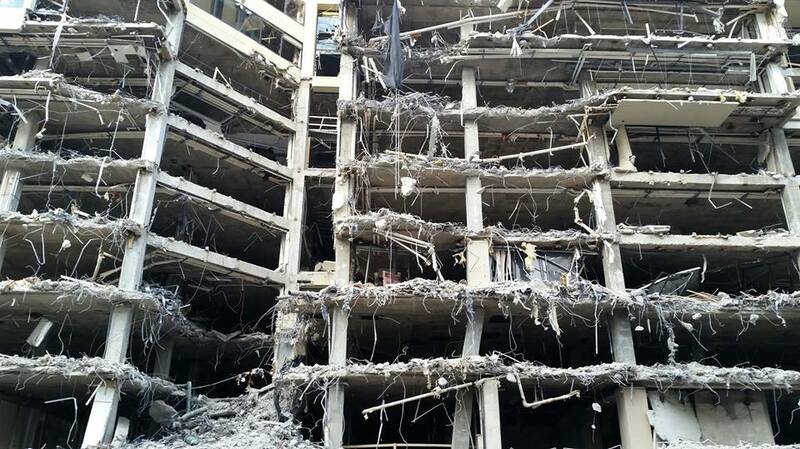 But that law was short lived, and today it is only the fifth-tallest building in D.C. The Capitol is shorter than the Washington Monument, the Basilica of the National Shrine of the Immaculate Conception, the Old Post Office and the Washington National Cathedral. The Capitol has its own subway, which has been there in some variation since 1909, and carries politicians from House and Senate office buildings to the Capitol. There are marble bathtubs in the basement of the Capitol where members of Congress would take baths back in the 19th century. The Capitol has its own crypt, which is located on the basement floor directly under the Rotunda. It is called that because President George Washington’s body was supposed to be entombed here. They even had holes dug for a viewing chamber where you could walk by and see him. But Washington’s wishes were to be buried at his home on the Potomac River, Mount Vernon. A bust of Abraham Lincoln located in the crypt and sculpted by Gutzon Borglum, has only one ear. The ear on the bust was originally supposed to face to the north because the sculptor believed Lincoln listened to Northern views and not those of the South. The ear now faces the South with its placement in the room. Directly below the crypt there is a nuclear fallout shelter. At any given time, several United States flags fly over the Capitol building and the flags have been flown continuously day and night since World War I. Two flagpoles are located at the base of the Capitol Dome on both the East and the West sides. Two other flagpoles are located above the North Wing (the Senate side) and the South Wing (the House side) and are flown only when the Congress is in session. There are also several additional flagpoles located west of the Dome and are not visible from the ground, these flagpoles are used to meet the congressional requests for flags flown over the Capitol. The U.S. Supreme Court also convened in the Capitol Building for 135 years, until moving into its own building in 1935. There is a myth that the Capitol is haunted by an evil demon cat. The reason this myth exists is because of mysterious paw prints in the sandstone floor just outside of the former Supreme Court Chamber. They still have not found an explanation for the paw prints. The Senate chaplain’s office has a rare oval window and it is one of the very few windows that still opens. It can be seen on the left side of the west front. For the first couple of decades, beginning in the fall of 1800 when the Federal government moved to D.C., the Capitol building was used during the administrations of Presidents Thomas Jefferson and James Madison for Sunday religious services as well as for governmental functions. 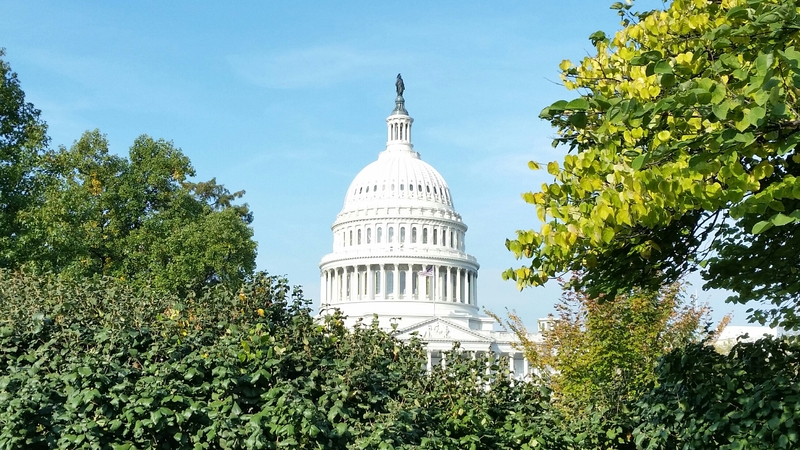 I’ve seen the Capitol Building almost every workday for the past thirty years. 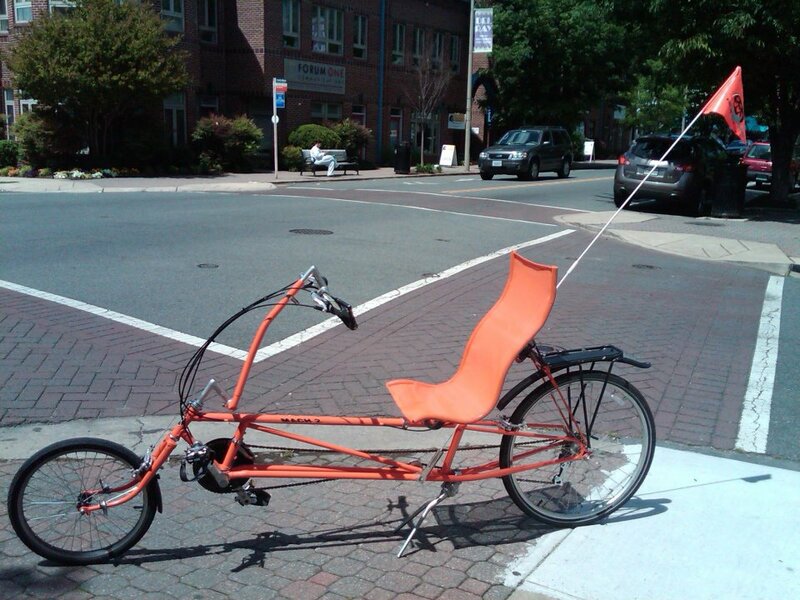 But I learned new things about it as a result of this bike ride. That’s just one of the reasons I ride. And I look forward to more rides next year. There are currently 435 posts on this blog about different places I’ve been to, events I’ve attended, or other interesting things I’ve seen throughout the city while out and about on my bike. But I have an ever-growing list of more places to which I still want to ride. And that list contains more places than the number places where I’ve already been. So I anticipate that I will continue to be riding not only next year, but for the foreseeable future. 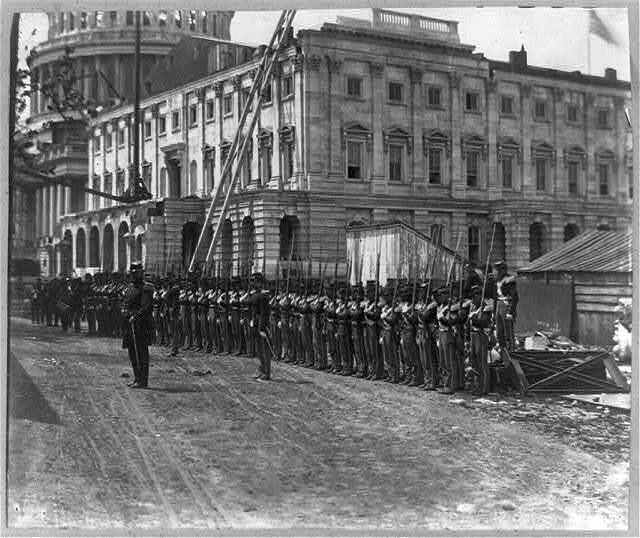 Note: The following historic photos obtained from the Library of Congress Prints and Photographs Division. 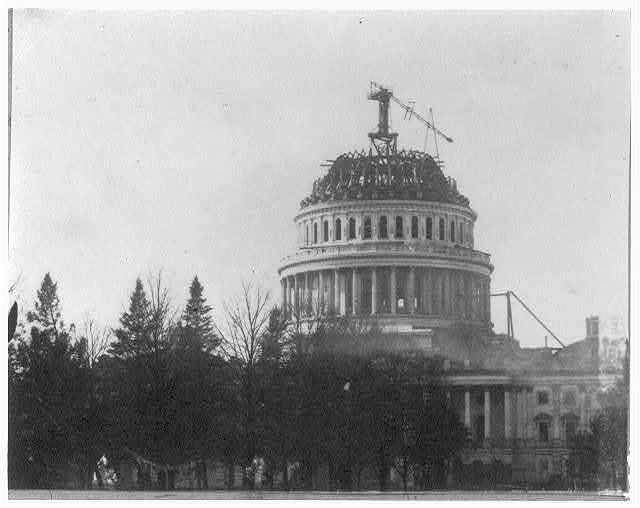 Top Left – Historic American Buildings Survey Copy of old photograph East Front of Capitol Dome under Construction, Showing Clairvoyee and Gates. 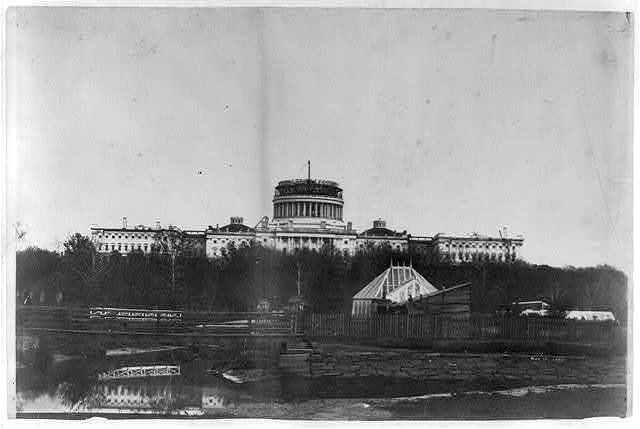 (Library of Congress Call Number: Habs DC,Wash,1–1 . 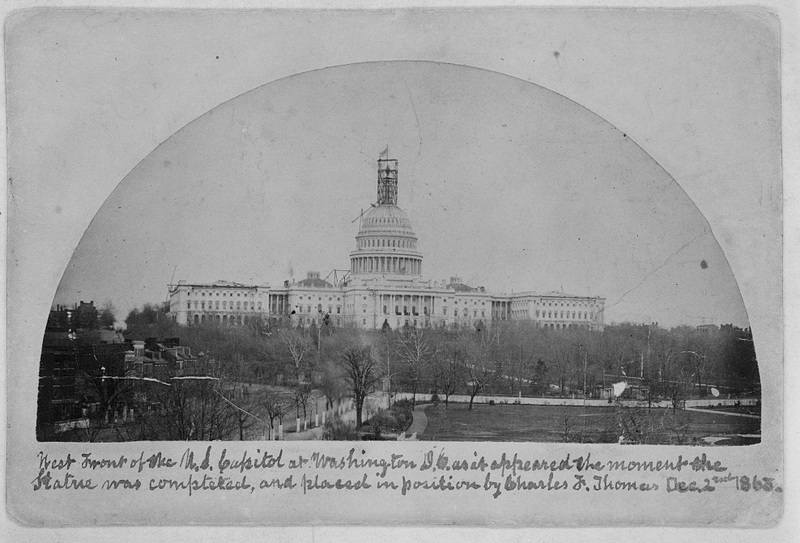 Photograph shows crowd attending ceremony; construction on dome of U.S. Capitol in background. (Library of Congress Call Number: LOT 12251, p. 41 [P&P]. Contributor: Benjamin Brown French. Date Created: March 4, 1861. 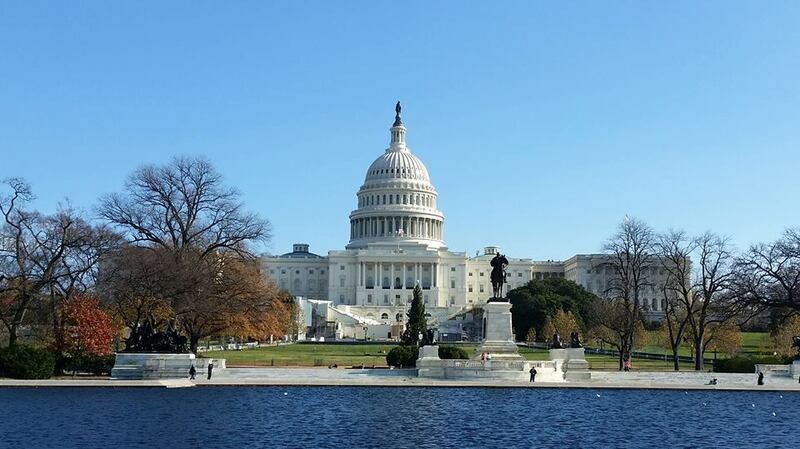 Note: A complete renovation and restoration of the iconic Capitol dome was just recently completed. 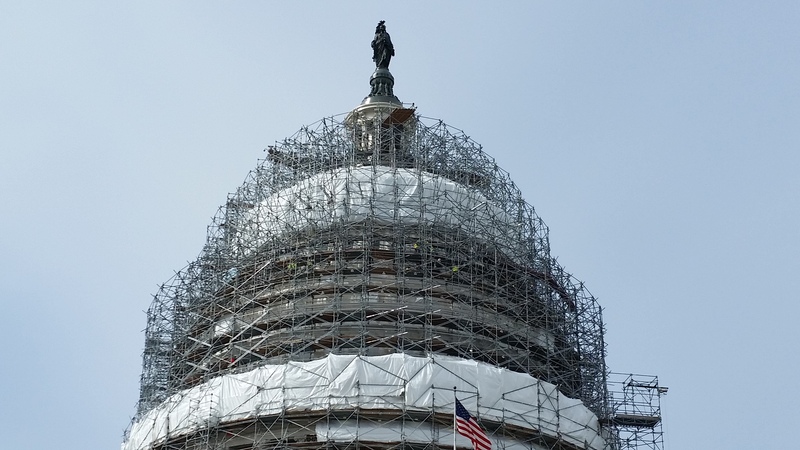 In 2014, scaffolding was erected around the Capitol Building’s massive dome for a three-year restoration project, the first major overhaul of the dome in more than half a century. After removing 14 layers of lead paint, applying 1,215 gallons of “Dome White” paint, the fabrication and replacement of exterior ornamentation, repairing deficiencies and over 1,300 different cracks in the cast iron and, finally, removing more than a million pounds of scaffolding, the Architect of the Capitol announced just last month that the restoration effort is officially complete. So the freshly painted and restored Capitol Building and dome will look pristine next month when it serves as the backdrop for the inauguration of President-elect Donald Trump. On this bike ride I was able to see a public sculpture that most people are no longer able to see. The sculpture is entitled “Fidelity, Bravery, Integrity” and was created by Frederick Charles Shrady, an American painter and sculptor who is best known for his religious sculptures. 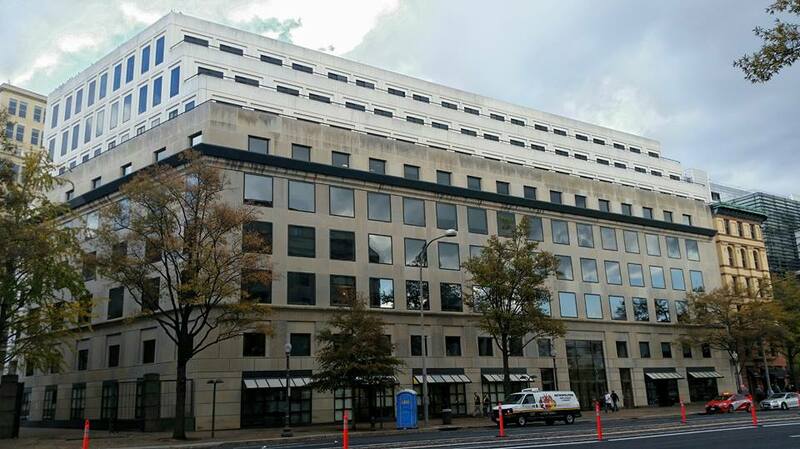 Most people can no longer see it because it is located in the courtyard of the J. Edgar Hoover FBI Headquarters building, which was once accessible to the public but was closed off years ago due to security concerns. 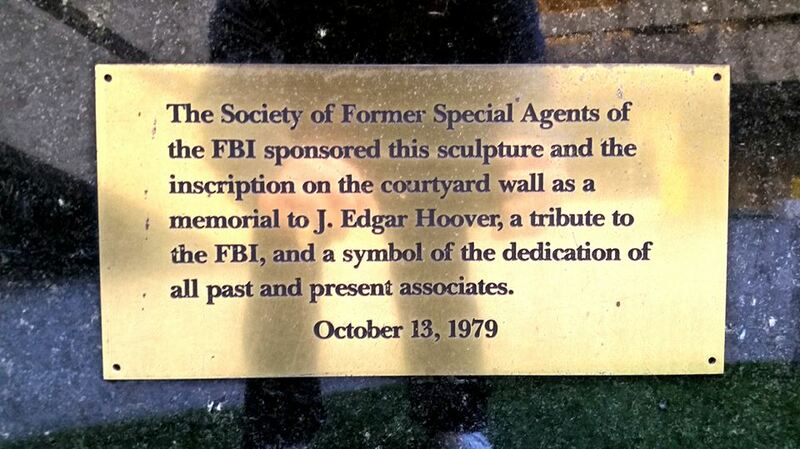 In January 1975, the Society of Former Special Agents of the FBI passed a resolution to create a memorial to J. Edgar Hoover. The memorial, which cost $125,000, was funded through private contributions. The artist was selected through a design contest, and the sculpture was dedicated on October 13, 1979. 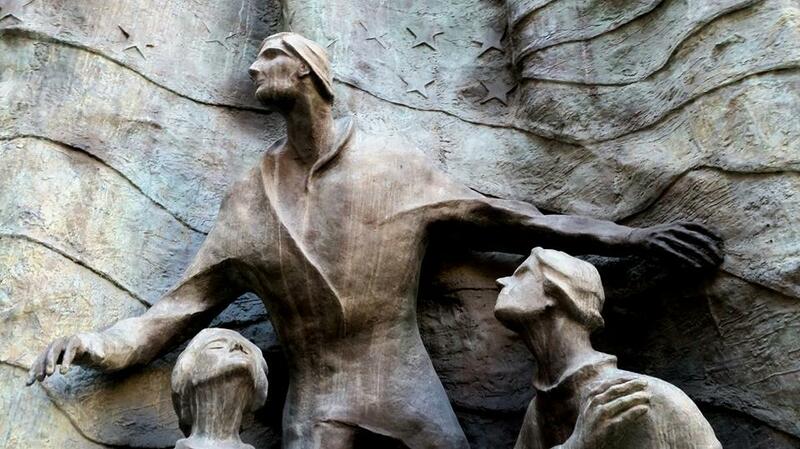 The statue, made of bronze, is 15 feet 7 inches wide and 5 feet 7 inches deep. The sculpture rests on a rectangular base 2 feet 6 inches by 10 feet 3 inches by 7 feet 4 inches made of slabs of black marble and mortar. The front of the base is carved and painted with the words “Fidelity, Bravery, and Integrity”. The piece depicts three figures which represent Fidelity, Bravery, and Integrity. These are intended to not only represent the acronym of the FBI, but the core values of the Bureau. The figures are placed against a backdrop of a large United States flag, which appears to be waving in the breeze. Fidelity, a female, is on the right, seated on the ground and looking up at a male figure of Bravery. To the left of Bravery is Integrity, a male figure who kneels on one knee, with his left hand on his heart. He looks towards Bravery, who stands flanked by the two other figures. The figures are simple with little detail, but none the less evocative based on their pose and appearance. In 1993, the piece was surveyed as part of the Smithsonian Institution’s Save Outdoor Sculpture! program and was described as needing conservation treatment. 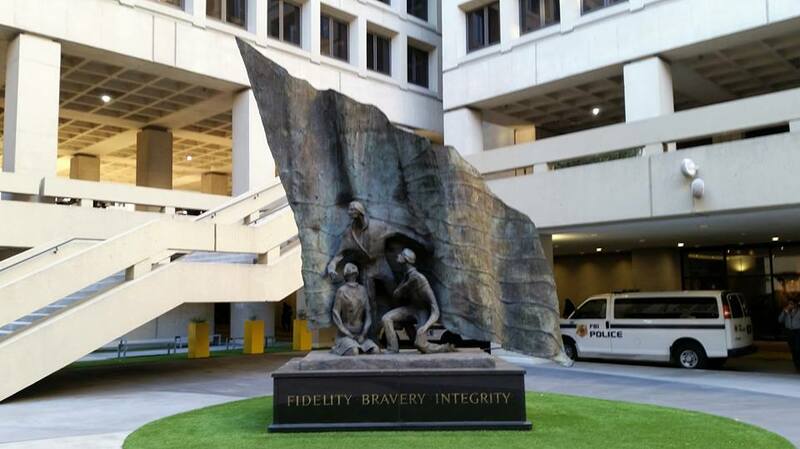 It’s unfortunate that the public no longer has access to view the sculpture and other displays in the courtyard of the FBI Headquarters building. Much like the old FBI tour, which was one of the most unique and popular tours in the city prior to the terrorist attacks of 9/11, it has succumbed to the need for greater security to protect FBI personnel. But I’m glad I was allowed the opportunity to see the sculpture, and to share what I learned about it with you here on this blog. The first American Red Cross Field Directors were sent to South Vietnam in February of 1962. The last Red Cross staff members to serve in country departed just over 11 years later, in March of 1973. During the intervening years there were five men and women of the American Red Cross who died in Vietnam in service to the Armed Forces. 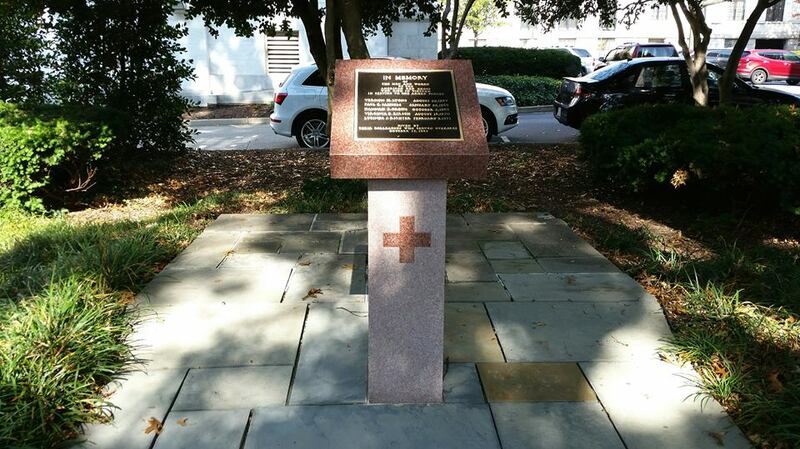 And on today’s bike ride, I went to see a small memorial to them, which is located on the grounds of The American National Red Cross Headquarters, which is located at 430 17th Street (MAP), just a few blocks from The White House. 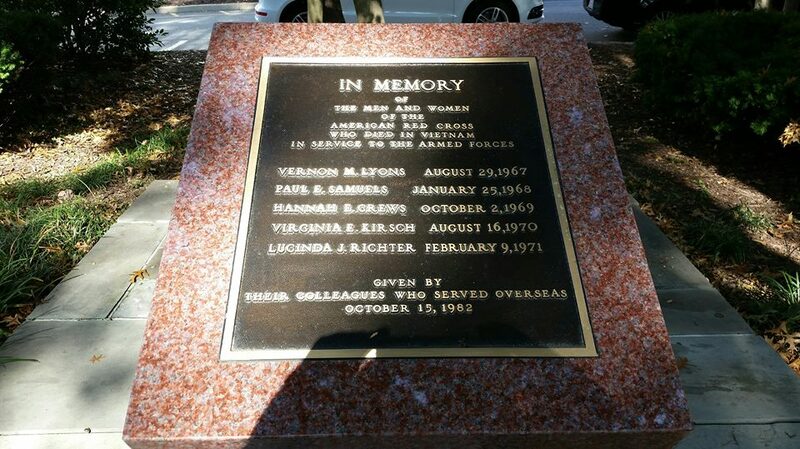 The five Red Cross workers killed while serving in Vietnam were Vernon M. Lyons, Paul E. Samuels, Hannah E. Crews, Virginia E. Kirsch and Lucinda J. Richter. But other than their names and the dates of their deaths which are inscribed on the memorial, there was no information about who they were or how they were killed. So I looked into it later, and this is what I found out. Of the five Red Cross workers killed, Vernon Lyons was the first. One of 300 American Red Cross field directors, hospital personnel and recreation workers serving in the war zone at that time, he on August 29, 1967, when his jeep exploded a mine near Danang. The 48-year old Lyons, who was from Wichita Falls, Texas, was serving as an assistant field director attached to the 1st Marine Division. Paul Samuels was killed on January 25, 1968, at the Khe Sanh Combat base, in northwestern Quảng Trị Province, Republic of Vietnam, during the initial stages of the Tet Offensive. At the time of his death, the 44-year old was serving as an American Red Cross field director. Little information is available about Hannah Crews other than that she died in a jeep accident in Bien Hoa on October 2,1969. Similarly, the only information I could find on Lucinda Richter was that she died of Guillain-Barre syndrome, a rare autoimmune disorder, in Cam Ranh Bay on February 9, 1971. Virginia Kirsch, or Ginny as she was known to her friends, was perhaps one of the most tragic stories because she murdered by someone she went there to serve. The 22-year old from Brookfield, Ohio, had been in Vietnam for only two weeks serving as one of 627 in-country recreation workers, affectionately referred to as Donut Dollies, when she was stabbed to death on August 16, 1970 in her billet at the headquarters of the 25th Infantry in Cu Chi, 20 miles northwest of Saigon. An investigation determined that she was murdered by an Army soldier named Gregory W. Kozlowski, who was arrested and charged. However, an Army Medical Review Board eventually issued a finding that Kozlowski was unable to determine right and wrong at the time of Ginny’s murder and that he was unable to cooperate intelligently in his own defense. As a result, charges against him were dismissed and he was never prosecuted for Ginny’s murder, the first in the history of American Red Cross service overseas. Because Lyons, Samuels, Crews, Richter and Kirsch were not in the military at the time of their deaths, their names are not inscribed on The Vietnam Veterans Memorial Wall. But their service and their lives are not forgotten. Note: After the charges for killing Ginny Kirsch were dismissed, Kozlowski was discharged and placed on the Temporary Disabled Retired List and his medical records were transferred to the Veterans hospital at Wood, Wisconsin. Twelve years later Kozlowski was arrested for the murder of a man in Milwaukee. He was ultimately found, again, to be mentally ill and remanded to a series of mental health institutions within the State of Wisconsin. However, after years of treatment and therapy, the psychiatric doctors deemed Kozlowski to no longer be a threat to either himself or others . In January of 2008, the Circuit Court granted Kozlowski a conditional release to a group home in Milwaukee. There has been no further information regarding his whereabouts since that date. You don’t normally see large outdoor murals in purely residential neighborhoods. 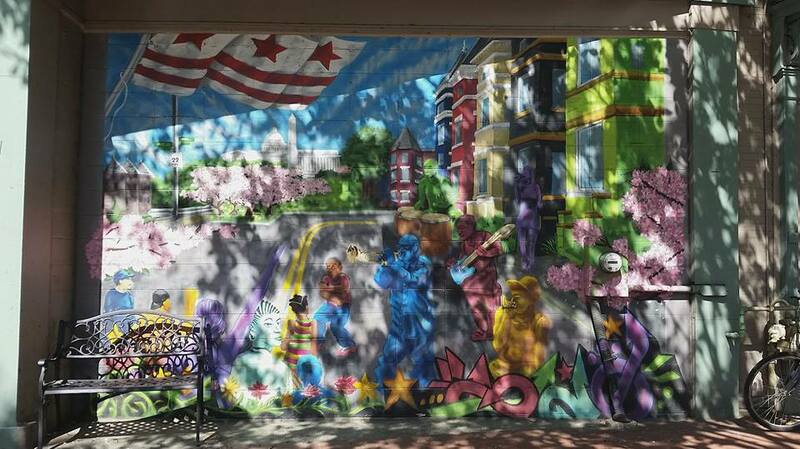 But on this lunchtime bike ride in northwest D.C.’s Bloomingdale neighborhood, I happened upon a mural I had not seen before. 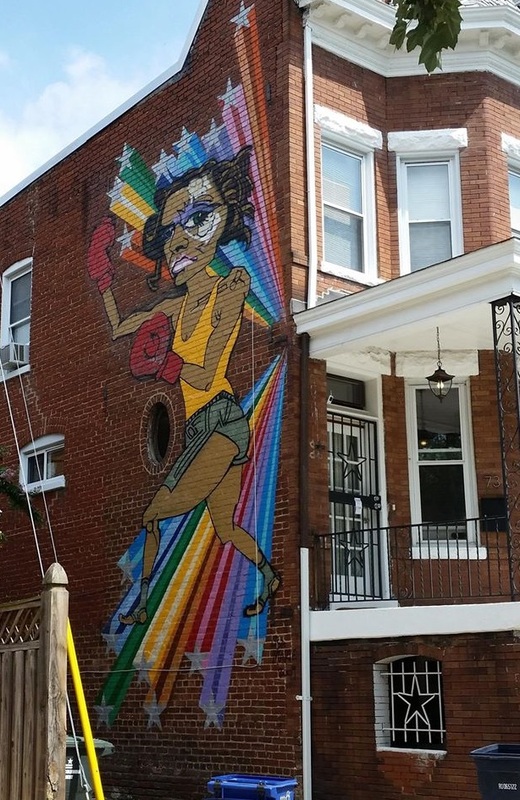 Located on the side of a home at 73 W Street (MAP), near the corner of 1st & W Streets, the mural depicts a young African-American woman wearing a yellow tank top and red boxing gloves, and sporting what symbolically appears to be a black eye. Behind her is a colorful shooting starburst originating from a specific point behind her. Because it seemed to me to be somewhat out of place for the residential neighborhood where it is located, I researched it later after the ride. And the story I learned was as oddly intriguing as the mural itself. The artwork was funded by the D.C. Commission on the Arts and Humanities, and was originally intended for a different location. However, that other venue fell through. It was at that point that Veronica Jackson, a local art collector and the principal of the Jackson Brady Design Group, which focuses on museum and art exhibition design, offered up its current location – her own Bloomingdale home. After its completion in the spring of 2009, however, some of the nearby residents objected to the mural. 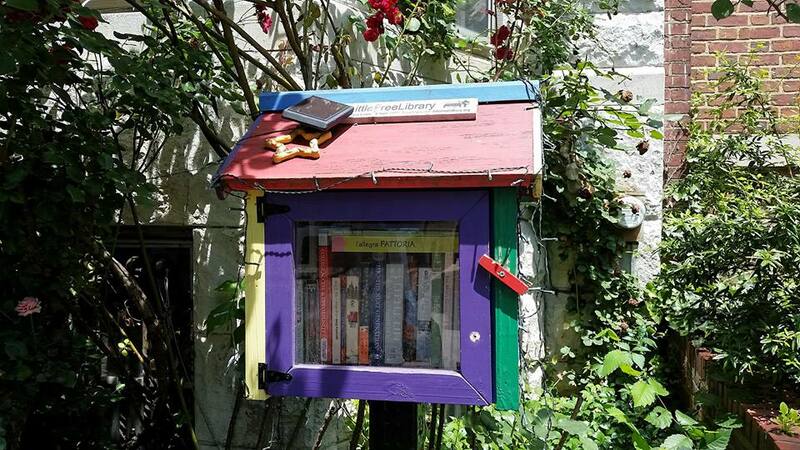 Some described it as out of place for the neighborhood, while others called it a blight or simply bad art. Some even complained that the mural was graffiti featuring hidden gang code, and described it as too “ghetto” for the area. By fall of that year the opposition to the mural grew to the point that a meeting of the Bloomingdale Civic Association was scheduled to address residents’ demands that the work be removed or covered up, demands that the mayor’s office was reported to be considering at that time. Nothing came from the meeting, however, with members of the Civic Association contending that they had no procedure for reversing projects that were already funded. But the dispute did not simply go away quietly. As part of a last-ditch effort to rid the neighborhood of Boxer Girl, one nearby resident actually asked police to determine if the mural caused an increase in crime in the neighborhood. 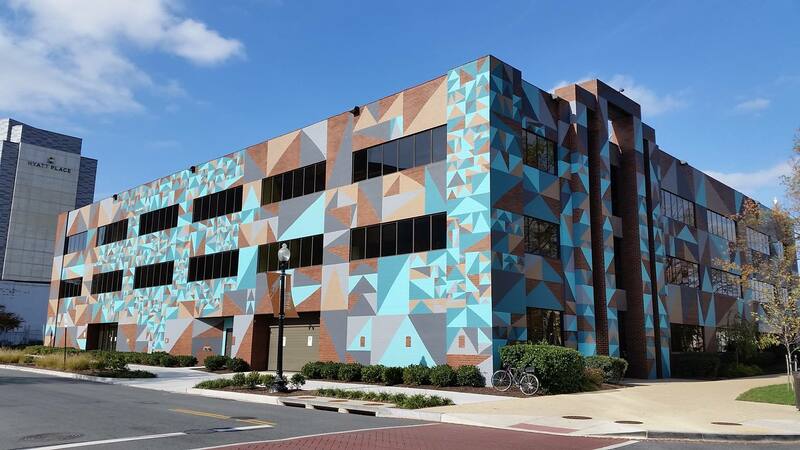 When the statistics indicated that there had been a 55 percent decrease in crime during the time since the mural’s completion, that effort was abandoned. Years after the murals creation, one of the neighbors who spearheaded the unsuccessful effort to have it painted over was reported to still not be on speaking terms with the homeowner on whose house the mural remains. But others have accepted it even if, like me, they think it looks a bit out of place. Yoko Ono once said, “Controversy is part of the nature of art and creativity.” And that certainly seems to be the case for Boxer Girl. But I have to say, the mural also seems to realize the artist’s hope that the image would “brighten the neighborhood”.